Fall is right around the corner and in Atlantic Canada the air has a crisp chill already. Fall is beautiful time of year here, bright mums flourish in the gardens and the leaves turn to the most gorgeous color palette of deep russets, copper and rich gold. 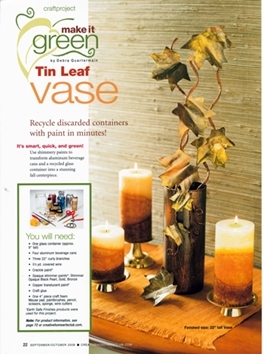 The turning of the maple leaves inspired my latest Make it Green column for Creative Homearts Magazine. While I was away my daughters consumed a whole case of root beer, the colors of the cans got me thinking about fall leaves (a stretch perhaps but in the crafty world not!) The beautiful GREEN (no VOCs paints) from EarthSafe Finishes cover anything so I cut up the cans and turned them into fall maple leaves. A recycled vase from a Valentine past and some covered wire remnants were transformed with Shimmer paints and Crackle finish from Earth Safe Finishes. The company founder Nancy Burkhart believes strongly in protecting the environment and at the same time providing quality products that are easy to work with. Voc's (Volatile Organic Compounds) are toxins in many paints and other products which vaporize into the air when drying and affect air quality. I am so fortunate to be able to write a column that lets me meet companies that are committed to the environment and creativity. Thank you to Nancy and her daughter Jessica, co-founders of Earth Safe Finishes! Follow the JOY! Keep Creating! Debra, CEO! Photo courtesy of Creative Homearts.